In a paper published online in Science Express, physicists at the Time and Frequency Division of the National Institute of Standards and Technology (NIST, Boulder, CO) have demonstrated sustained, reliable information processing operations on electrically charged atoms (ions). Their new device is able to perform a complete set of quantum logic operations without significant loss of information in transit. This path-breaking work overcomes significant hurdles in scaling up ion-trapping technology from small demonstrations to larger quantum processors. “The significant advance is that we can keep on computing, despite the fact we’re doing a lot of qubit transport,” says first author Jonathan Home. In the new demonstration, the team of researchers repeatedly performed a combined sequence of five quantum logic operations and 10 transport operations while reliably maintaining the 0s and 1s of the binary data stored in the ions, which serve as quantum bits (qubits) for a hypothetical quantum computer, and retaining the ability to subsequently manipulate this information. Previously, scientists at NIST and elsewhere have been unable to coax any qubit technology into performing a complete set of quantum logic operations while transporting information without disturbances degrading the later processes. [Image Credit: J. Jost, NIST] NIST team demonstrated sustained, reliable quantum information processing in the ion trap at the left center of this photograph, improving prospects for building a practical quantum computer. The ions are trapped inside the dark slit (3.5 mm long and 200 micron wide) between the gold-covered alumina wafers. By changing the voltages applied to each of the gold electrodes, scientists can move the ions between the six zones of the trap. The NIST group performed some of the earliest experiments on quantum information processing and has previously demonstrated many basic components needed for computing with trapped ions. The new research combines previous advances with two crucial solutions to previously chronic vulnerabilities: cooling of ions after transport so their fragile quantum properties can be used for subsequent logic operations and storing data values in special states of ions that are resistant to unwanted alterations by stray magnetic fields. As a result, the NIST researchers have now demonstrated on a small scale all the generally recognized requirements for a large-scale ion-based quantum processor. Previously they could perform all of the following processes a few at a time, but now they can perform all of them together and repeatedly: (1) “initialize” qubits to the desired starting state (0 or 1), (2) store qubit data in ions, (3) perform logic operations on one or two qubits, (4) transfer information between different locations in the processor, and (5) read out qubit results individually (0 or 1). Through its use of ions, the experiment showcases one promising architecture for a quantum computer, a potentially powerful machine that theoretically could solve some problems that are currently intractable, such as breaking today’s most widely used encryption codes. Relying on the unusual rules of the submicroscopic quantum world, qubits can act as 0s and 1s simultaneously, unlike ordinary digital bits, which hold only one value at any given time. Quantum computers also derive their power from the fact that qubits can be “entangled,” so their properties are linked, even at a distance. Ions are one of a number of different types of quantum systems under investigation around the world for use as qubits in a quantum computer. There is no general agreement on which system will turn out to be the best. These experiments stored the qubits in two beryllium ions held in a trap with six distinct zones. Electric fields are used to move the ions from one zone to another in the trap, and ultraviolet laser pulses of specific frequencies and duration are used to manipulate the ions’ energy states. The scientists demonstrated repeated rounds of a sequence of logic operations (four single-qubit operations and a two-qubit operation) on the ions and found that operational error rates did not increase as they progressed through the series, despite transporting qubits across macroscopic distances (960 micrometers, or almost a millimeter) while carrying out the operations. The researchers applied two key innovations to quantum-information processing. First, they used two partner magnesium ions as “refrigerants” for cooling the beryllium ions after transporting them, thereby allowing logic operations to continue without any additional errors due to heating incurred during transport. The strong electric forces between the ions enabled the laser-cooled magnesium to cool down the beryllium ions, and thereby remove heat associated with their motion, without disturbing the stored quantum information. The new experiment is the first to apply this “sympathetic cooling” in preparation for successful two-qubit logic operations. The other significant innovation was the use of three different pairs of energy states within the beryllium ions to hold information during different processing steps. This allowed information to be held in ion states that were not altered by magnetic field fluctuations during ion storage and transport, eliminating another source of processing errors. Information was transferred to different energy levels in the beryllium ions for performing logic operations or reading out their data values. The experiment began with two qubits held in separate zones of the ion trap, so they could be manipulated individually to initialize their states, perform single-qubit logic operations, and read out results. The ions were then combined in a single trap zone for a two-qubit logic operation and again separated and transported to different trap regions for subsequent single-qubit logic operations. To evaluate the effectiveness of the processes, the scientists performed the experiment 3,150 times for each of 16 different starting states. The experimental results for one and two applications of the sequence of operations were then compared to each other, as well as to a theoretical model of perfect results. The NIST quantum processor worked with an accuracy of 94%, averaged over all iterations of the experiment. In addition, the error rate was the same for each of two consecutive repeats of the logical sequence, demonstrating that the operations are insulated from errors that might have been introduced by ion transport. The error rate of 6 percent is not yet close to the 0.01% threshold identified by experts for fault-tolerant quantum computing, Home notes. Reducing the error rate is a focus of current NIST research. Another issue in scaling up the technology to build a practical computer will be controlling ions in large, complex arrays of traps—work also being pursued by the group. 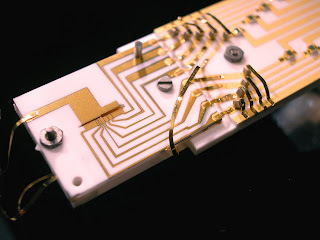 There are also more mundane challenges: The researchers successfully performed five rounds of the logic and transport sequence (a total of 25 logic operations plus 4 preparation and analysis steps), but an attempt to continue to a sixth round crashed the conventional computer used to control the lasers and ions of the quantum processor. Nonetheless, the new demonstration moves ion-trap technology significantly forward on the path to a large quantum processor. J.P. Home, D. Hanneke, J.D. Jost, J.M. Amini, D. Leibfried and D.J. Wineland. "Complete methods set for scalable ion trap quantum information processing". Science Express (Published Online August 6, 2009). Abstract.